Leica has a long, proud history of telling anyone who’ll listen that its Noctilux lenses are the best of the best – and to be fair, the boast isn’t entirely unjustified. 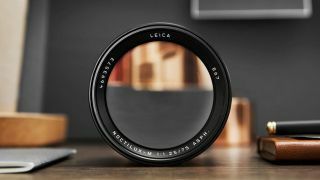 Famous optics like the Noctilux-M 50 mm f/0.95 ASPH have deserved the acclaim heaped upon them – and today, the Leica Noctilux-M 75 mm f/1.25 ASPH, joins the lineup. Made for M-mount, the lens comes with the heady promise of redefining depth of focus. Compatible with the Leica SL via an adapter, the Noctilux-M 75mm employs a precise optical design in order to produce sharply isolated subjects and vivid, unique bokeh, with its 75mm focal length making it a perfect partner for portraiture. The lens is constructed of nine elements in six groups, and this includes two aspherical elements for edge-to-edge sharpness. Leica says it has only used glass with high anomalous partial dispersion and low chromatic dispersion characteristics in the lens’s construction, while a floating element keeps performance high at a range of camera-to-subject distances. "Soft and harmonious" bokeh is produced by an eleven-bladed iris, and the lens also comes with an integrated, lockable hood for keeping away extraneous light (and to keep the front element clear of dust and dirt). Leica promises that the lens’s large resolving power should render it future-proof, in the sense that it will be able to cope with sensors with higher pixel counts than those in today's cameras. Now here’s the bad news: the Leica Noctilux-M 75mm f/1.25 ASPH arrives with a suggested price tag of $12,795 (a little under £9,500), and it’s slated to be available at the beginning of 2018. In the meantime, take a look at Leica’s website for more on the lens.